During the 1st year of this students will learn and demonstrate the basic skills that are essential in the Plumbing & Heating field. Students will have an opportunity to work with a variety of modern tools and materials used by plumbers in the field. Students will work with many different materials that are found in both residential and commercial settings. Students will be introduced to the State plumbing code and begin exploring how and why this effects the work we do and how we do it. During the 1st semester students will work toward the OSHA-10 general construction certification. Completion of this certification is a prerequisite to enter Plumbing and Heating Technologies II. In the spring students will have the opportunity to work offsite on various Parks and Recreation buildings, as we open them for use in the spring. Hands-on projects, using tools and applying the knowledge learned in class. Field Sites, going off school property to work on real jobs. Learn skills that will last a lifetime. 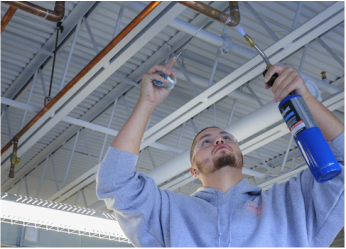 During the Plumbing & Heating Technologies II students will continue to add to their knowledge and skills of the plumbing & heating field. Students will learn advanced piping techniques for various types of systems. Students will continue to look deeper into the State Plumbing code and working more in- depth with blueprints and equipment documents. Students will spend more time working in the field on job sites installing and maintaining many different types of plumbing and heating systems. In the fall the students will be responsible for winterizing many Parks and Recreation sites, and doing any repairs these facilities require. We will begin to explore different types of heating systems, including oil, propane and natural gas. Students will have the opportunity to work with various types of hydronic heating equipment and pipe in boiler systems. Students will be introduced to the basic HVAC concepts including A/C and refrigeration. Students will learn have the opportunity to work on different types of oil burners, they will learn about the components of the burner and how they work. Students will learn how to install and service various commercial and residential plumbing fixtures.